Definition: The Strategic Alliance is a cooperative agreement between two companies that agree to share resources to pursue the common set of goals but remain independent after the formation of the alliance. The extent to which the partners must interact to have the alliance work effectively. Understand the potential of conflict that may arise out of being competitors in the market. 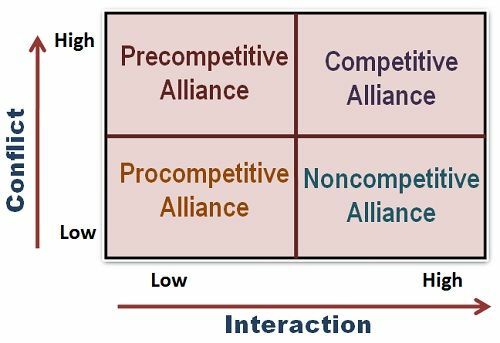 Procompetitive Alliances: The procompetitive alliance is characterized by low interaction and low conflict. Such alliances offer the benefits of vertical integration, i.e. a relationship between the manufacturer and its suppliers or distributors, without the firms actually investing the resources in the manufacturing firm or distributing the semi-finished or finished goods. Noncompetitive Alliances: Such alliances are characterized by high interaction and low conflict. The noncompetitive alliances are formed between the companies that operate in the same industry but do not consider each other as rivals. Their business operations do not coincide and are quite distinctive due to which the feeling of competitiveness does not emerge. Often, the companies that have expanded geographically within the industry adopt the noncompetitive alliance. Competitive Alliances: As the name suggests, these alliances are characterized by high interaction and high conflict. Here, two competing firms that perceive each other as rivals come together to form an alliance and. Therefore, the intense interaction between the two is necessary. Such alliances could be intra- or inter-industry. Often, the foreign companies operating in India forms a competitive alliance with the local rival companies for specific purposes. Precompetitive Alliance: The precompetitive alliance is characterized by low interaction and high conflict. Such partnership brings two firms from different, most often unrelated industries to work towards a specific activity, such as new product development, new technology development, or creating awareness among the potential customers about the use of new product or idea. The joint R&D activities and advertising campaigns are the examples of a precompetitive alliance. Thus, the strategic alliance types are classified on the basis of interaction and the potential of conflict between the partners to the contract.